It has been a winter wonderland in these parts! The snow stopped earlier this week, but the freezing temps have really kept things white and pretty. We have had serious indoor weather for the last week but we still managed to make the best of it. I took a moment after putting Gideon down for his nap one day, and spent about 15 minutes taking pictures and feeling overwhelmed with the beauty around me! I feel so blessed to be surrounded by such pretty views. Gideon has been really interested in snowmen this winter. I got him a few library books and books on consignment about snowmen, and he loves them. 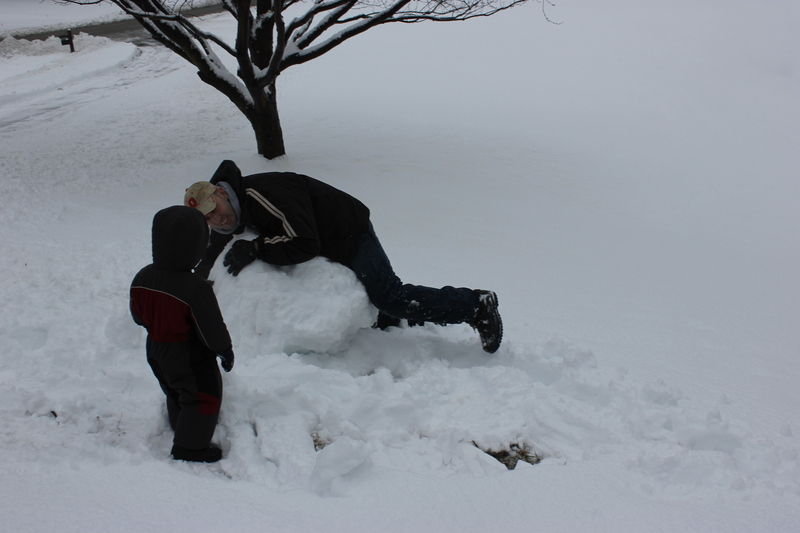 So as soon as the snow settled, and took on good “packing” properties, the boys got outside to build Gideon’s first snowman! Gideon named the snowman, “Snowman”. We think that’s pretty fitting. I’m so glad that Gideon was finally in good health when it snowed. He finally got to enjoy it and have fun! Did you get out to play in the snow? Did you build anything? One of my favorite times of day is the first hour or two of the morning. I’m usually so under-rested that I have a hard time thinking straight. Luckily, Gideon’s expectations of me are “give me milk, change my diaper, snuggle me, read me books”, which I can handle. Neither of us are bouncing off the walls ready to wrestle, so we get along pretty well. Having the most adorable bed head you’ve ever seen doesn’t hurt in keeping my morning spirits lifted. Neither do his puffy eyes and groggy voice. I just melt into a puddle of sappymamamush. Gideon’s favorite song of the moment is called “White Winter Hymnal” by the Fleet Foxes. He’s especially obsessed with Pentatonix’s cover of this very melodic song. Daniel and I both have tried and tried to get him singing this song on video with no success. But here is a video of Gideon first thing in the morning exercising his free will, and denying me my wishes. Although in all fairness he does the knee slap routine and sings “ooh ooh”. Finally, notice the wicked awesome bed head. Kids in our area are going on 6 days of no school. 3 of them due to the weather. I can’t imagine they are complaining. Who doesn’t want to sleep in and play in the snow all day? This winter has been relatively mild, so it was only suiting that we would get hit with a good mid-February snowfall. I remember how excited I got over school closings back in the day. Now snow days just mean that I get to miss some of our weekly activities that I look forward to. Story Time, Movers and Shakers, Mommy Bible Study. All cancelled. So … we do a whole lot of playing, making up activities, and re-organizing the entire kitchen. You do what you’ve got to do when dinner needs to be made. Ready to get snowed on! So big, yet so tiny. Tonight it’s getting down to -8*, and the high for tomorrow is 9 degrees. We will be spending yet another day at home! Cabin fever stay away! Gideon is on the mend! He has a bit of a runny nose and residual cough, but he is out of the woods. We had such a busy, fun-filled weekend that started with a visit to the Children’s Museum with Daniel’s mom. Gideon is finally of age to appreciate and interact with all the activities they have set up in the toddler area. There are animals, train tables, and all sorts of areas for little ones to climb, and slide, and work on all that motor planning and strengthening that’s so important at this stage of life. He is obsessed with trucks and chickens, so this ride was perfect for him. First time playing with sand. About 20 minutes were spent here. Gideon must be going through a growth spurt. He falls asleep the second the car starts going, and he’s been taking 2-4 hour naps! I don’t mind the down time, but I’m noticing he’s getting harder and harder to carry. My growing boy is outgrowing his mom’s short arms. My little, growing, sleepy, nerd. Hanging out with daddy, legs crossed, and hands tapping to the beat. Daniel and I are already noticing little traits that make Gideon who he is. One very distinctive piece of his personality, is the need for order. He is very particular about how things are done, and wants them done correctly. One of our challenges as parents will be to cultivate these wonderful traits he is already exhibiting, while giving him tools so he can find balance in his life. I always want him to have order if that is what he needs to be happy and successful in life. But I also want him to be flexible and appreciate his peer’s priorities. One thing is for sure already. We are not raising a follower. He is definitely a leader in the making! He lines up all his toys, and even these window stickies. I think it’s noteworthy to mention that Gideon is already bombarding us with the “wh” question that all parents come to dread. That’s right. He has learned to ask “why?”. Here we go! Here’s a video of Gideon’ contagious laughter to make you smile. I’ve finally decided that it’s time to pick up where I left off. After a long lapse in blogging I remembered how much I enjoy doing it. I also love looking back on what happened months and years ago. The story of my family, and how my life evolves as a wife and mother is very valuable to me. So here I am getting back to my long-lost hobby! The first two months of 2015 brought a lot of illness with them. In January I came down with some pretty bad strep, and was in bed for about 4 days. Between Daniel and his dear parents, Gideon was very well taken care of and loved on while I recovered. Then my little man came down with a bad cold and we’ve been cooped up in the house for the better part of February. We are all sleep deprived, and feeling the itch to get back to normalcy. 1. Extra snuggle time. I forget all about my housekeeper duties when Gideon asks me to sit and hold him. I could hold him the rest of my life. 2. I have enjoyed not being “busy” with things other than the boys and the house. It’s been a nice break to really evaluate my life, and focus on how grateful I am for the two most important people in my life. 3. This time has forced me to be a little more creative in the toddler entertainment area. I think Gideon has had some of the best fun, and we’ve done a lot of laughing and enjoying each other. my little bookworm spent a lot of time cuddled up reading books. Gideon is obsessed with his sensory tub. He asks for “bens” (beans) very often. Keeps him busy when I’m busy. It might be cold and icy outside, but Gideon was getting lots of baths! We read Gideon’s Thomas the Train book 1,454,283,9556 times. We want this book to die a slow and painful death. I say this little quote all the time, and to see it advertised on a medicinal item at the regular grocery store gave me hope! Gideon seems to be on the mend, and he’s been fever free for over 48 hours. This evening he started coughing and his little nose got stuffy again. We’ll see what tomorrow brings!